In spite of having a single major flaw (repetition, repetition, repetition), the first Assassin’s Creed made a surprisingly strong finish. When my occasional return to the game over the course of a few years culminated in an exciting anti-conclusion, I was really looking forward to the next chapter in the continuing saga of Desmond Miles. 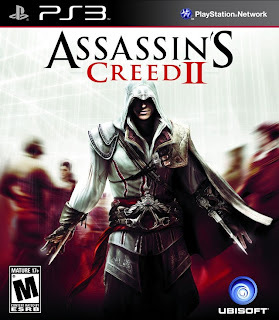 I absolutely had to get my hands on a copy of Assassin’s Creed II. Assassin’s Creed II’s picks up right where the first game left off: Desmond Miles being held against his will in a lovely post-modern bedroom in an Animus testing lab. Right away, craziness ensues, and Desmond ends up climbing back into an Animus machine. However, it isn’t Altaïr that he follows. He begins to relive the genetic memories of Ezio Auditore during the last third of the 1400s in Italy. The fight between the Knights Templar and the Assassins hasn’t calmed down during the 250 years since Altaïr acquired the first piece of Eden, and as much as I enjoyed the story and setting of the first game, I thought the narrative arc in Assassin’s Creed II was much more cohesive and engrossing, in part due to Ezio being a much more fully-realized character than Altaïr. The strength of the story would have meant very little if the plot was driven by a series of highly repetitive tasks (an unfortunate occurrence that completely sapped the momentum of the first game). Not only does Assassin’s Creed II possess a surprising amount of variety in its gameplay, but it is integrated in the plot exceptionally well. I never felt as though I was performing needless tasks in order to earn the next story event: I was following the important events in Ezio’s quest for vengeance. There is much to do when you not pushing through Ezio’s memories. Side quests range from exacting punishment against wayward husbands to racing local free-runners to assassinating evil people to achieve political gain. When you’re not doing that, you can work on improving your family villa by restoring the town of Monterrigioni and buying famous works of art in the cities you visit. You can purchase new armor and weapons from the blacksmith. You can even drop in on the tailor and dye your clothes new colors if you love fashion, and there’s no shame in a healthy appreciation of fashion. There are 6 assassin tombs to explore, consisting of some of the most challenging (and eventually... very rewarding) platforming sections in the game. Then you can search for your little brother’s feathers, which are scattered all over Italy. Then there are glyphs hidden on landmarks, which reveal the secrets of the templar order and the struggle of a fellow Animus user. There is quite a bit to do in Assassin’s Creed II. However, you can stick to the main quest if you like. Aside from all that there is to do in Assassin’s Creed II, the game is presented just beautifully. The animation and sound design of the citizens and the city itself goes well beyond the repetitive townsfolk of its predecessor and makes for one of the well-realized and immersive worlds in any game. I may have referred to Assassin’s Creed as "almost marvelous", but Assassin’s Creed II has certainly succeeded where the first game failed. 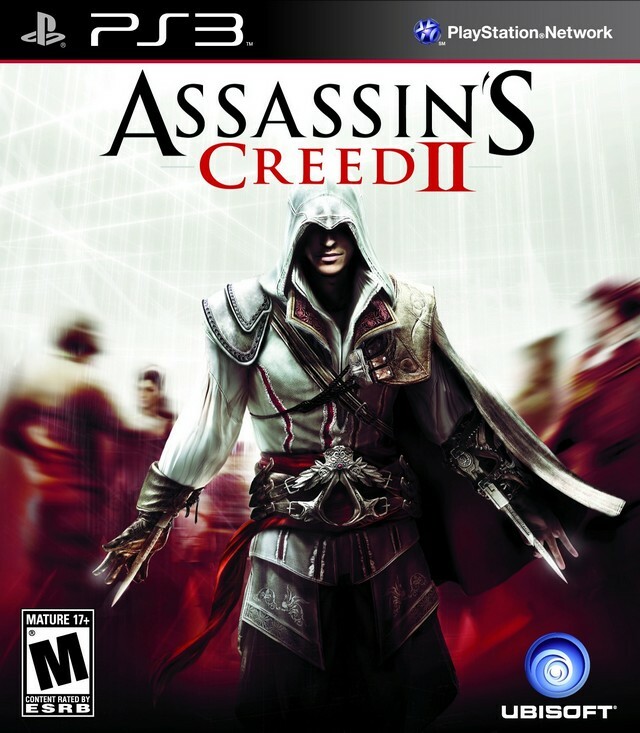 Assassin’s Creed II is not just a thrilling game. It is a pseudo-historical European vacation guided by a compelling cast of characters that are sure to have you waiting anxiously for Assassin’s Creed: Brotherhood, assuming they don't murder you and hide your body in a cart filled with hay.